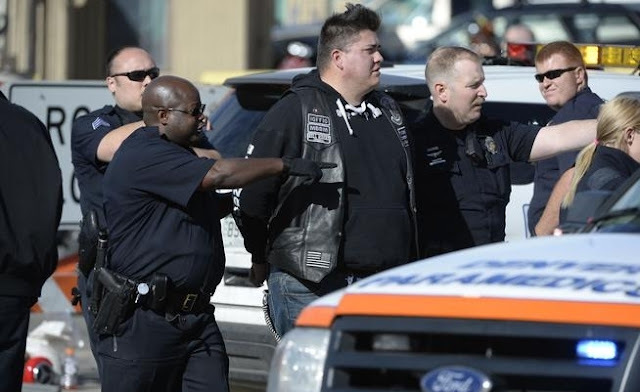 Denver Police escorted a man in handcuffs away from the National Western Stock Show. DENVER, CO - January 30 - At least one person was killed after a shooting/stabbing melee Saturday afternoon at the National Western complex. Denver Health tweeted shortly before 2 p.m. that nine people had been transported to area hospitals. The fight broke out between the Iron Order and the Mongols MC. 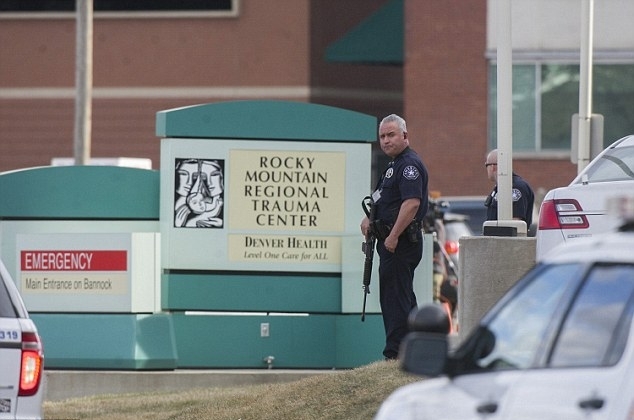 At a 3:30 p.m. news briefing, the hospital said 7 patients were brought in after the shooting. One died, three are critical and three are stable. Bob Cook witnessed the shooting. His booth for Quarterchaps, a leather goods company was located across from where the shooting happened. He heard two shots fired and saw people dive under tables. He didn't hear any arguments before the shooting and doesn't know what may have prompted it. He said there were puddles of blood on the floor, but minutes later, the scene returned to normal. "Everyone is so desensitized," he said as he pointed to dried blood on the floor that people were walking over. Britney Shaw was working at a jewelry stand when she saw a group of about 50 men brawling on the stairs, which are now covered in blood and cordoned off. Denver Health Medical Center put its campus on a precautionary lockdown to ensure patient and visitor safety. There have been no threats made to the hospital. One officer on duty there has a semi-automatic rifle slung over his shoulder. ER doctor Kevin McVaney said the hospital was able to handle the emergency. "We are very prepared for this number of trauma patients." All seven arrived via ambulance and no other injured parties are expected. Denver Health encouraged people who don't have a specific need to come to the hospital to avoid the campus. 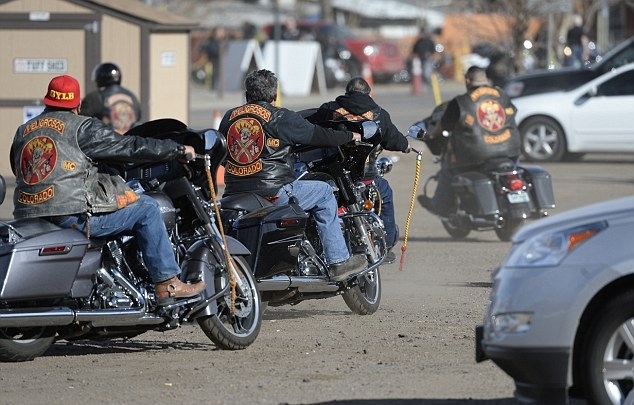 The 38th Annual Colorado Motorcycle Expo is being held this weekend at National Western complex. Raquel Lopez, Denver police spokeswoman, said the disturbance happened at 12:48 p.m. Multiple shots were fired and at least one person was stabbed. No arrests have been made. 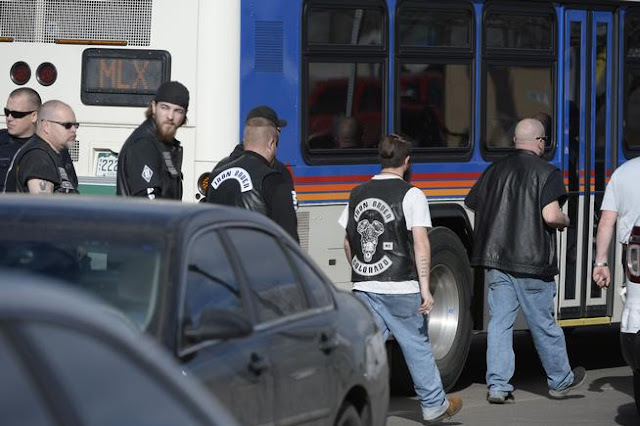 Several men were escorted to an awaiting RTD bus at the National Western Stock Show Complex. 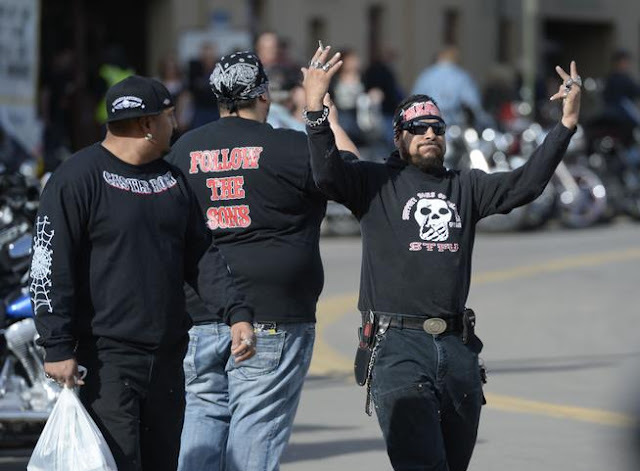 One witness, who asked to remain anonymous out of fear of retaliation, said the feud was started by rival biker clubs. Police filled the parking lot. People who left the show and crossed the police tape are not being allowed back into the building. No new attendees are being allowed in, but people who are still in the building have not been asked to leave and continue to mill about and shop leisurely. Some of the people who came out are angry they won't be let back inside. 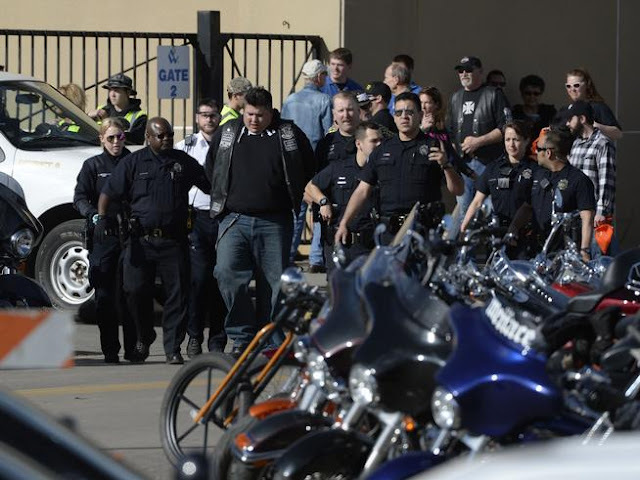 Denver Police escorted a man in handcuffs away from the National Western Stock Show complex. Mary Eckhart, who left the building, said some people attending the show don't even know about the violence. She said she attends the expo every year and is angry that some feuding people "can't control their tempers for one day." The Kicker Arena Cross Show, which is scheduled for 6:30 p.m. in the National Western Event Center, will go on as planned. 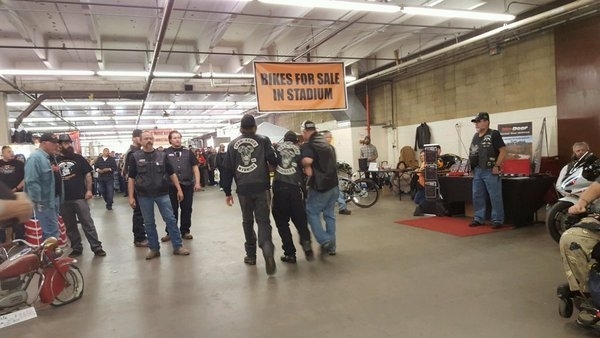 Organizers of the motorcycle expo have not announced whether the show will continue as scheduled on Sunday. 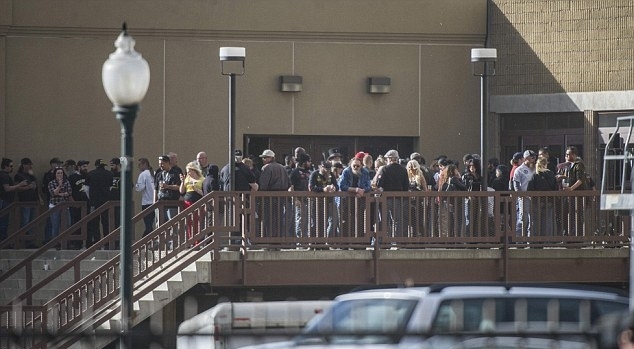 People gather outside the National Western Complex on after the deadly shooting and stabbing. A large crowd above outside of the National Western Complex after the shooting. 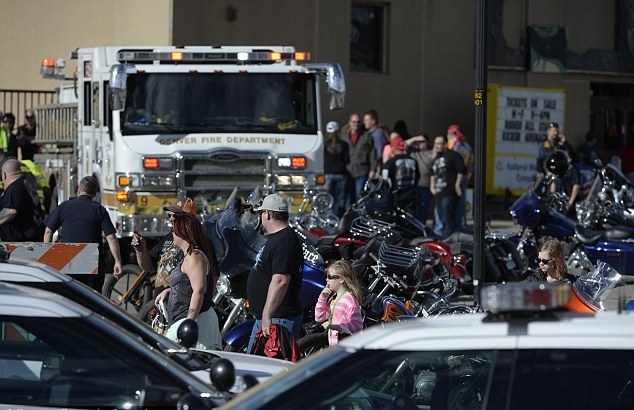 Bikers leaving the arena in Denver following the shooting and stabbing at 1pm this afternoon. The hospital is currently on lock down after the shooting at the motorcycle expo.